Submitted by lynn on Thursday, October 13, 2011 - 12:57am. At the Gourmet Experience, visitors have their choice of live cooking demos, food competitions, and gourmet foods and products! Besides the vendors, there were three different stages that showcased various chefs and their foods: the Gourmet in Action state, the Outdoor Grilling Stage, and the Kids Cook Activity Stage. We attended on Sunday Oct. 9th 2011. The first person to grace the Gourmet In Action Stage was Chef Ro Zinniger, who showed the audience how to make Caramel Apple Cupcakes. A TV screen to the right of the stage had a live feed with closeups, giving us insightful visuals as she taught us! These pros definitely know how to make others feel like they can create something delicious too! Afterwards, we found Chef Ro Zinniger at The Sweet Discoveries Pavilion, where the Confection Artist Competition was being held. 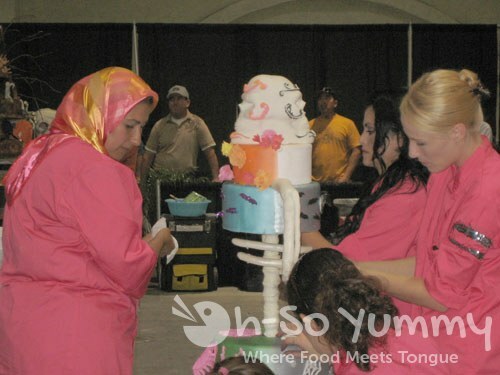 She informed us that the two teams, one north and one south, had been working on their cakes since the day before and had to incorporate six rounds of styrofoam, which were between 8-18" inches high, into their cake. In the cake pictures below, you'll definitely see them! Almost everything else was made from sugar except some wooden supports. The North Team was called the Wicked Cake Ladies of the North. Their cake display made me think of Dias de los Muerto and had extensive piping detail everywhere. The cake was taller than everyone on the decorating team! The whole cake rotated around its axis, had flashing lights, and a fog generator! The South Team was from the San Ysidro Adult School. This haunted house cake gave us the creeps, but in a good way! I thought the spooky ghoul gave it a nice touch. This cake also had a motorized component with a witch flying above the house as well as the fog generator. In the end, after tallying the score and taking deductions, the Wicked Cake Ladies of the North claimed victory over their opponents. Great job ladies! If you haven't read about the Fish Taco TKO Competition, we did some coverage here. 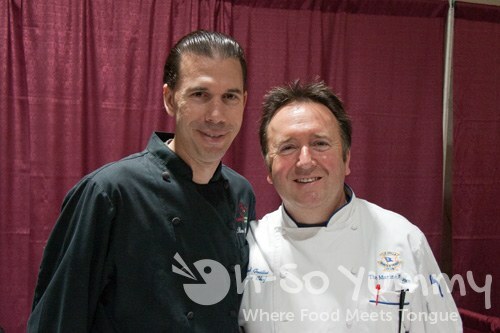 By the book signing table, we greeted Chef Bernard Guillas and Chef Ron Oliver, authors of the book Flying Pans - Two Chefs. 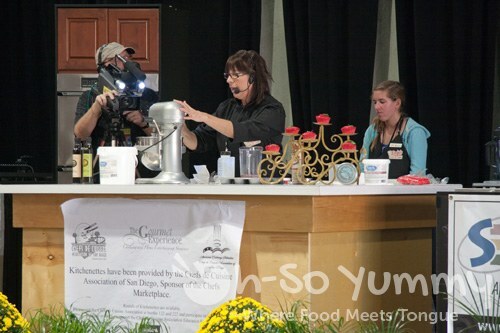 They were the second demo on the Gourmet In Action Stage and showed the audience how to make a very delicious but simple mushroom soup from their book! On the Kids Cook Activity Stage, Chef Katy Clark, one of the contestants on Next Food Network Star, gave parents and their children little tips such as the ABCs of the kitchen: Always be safe, Be creative, and Clean up your workspace! 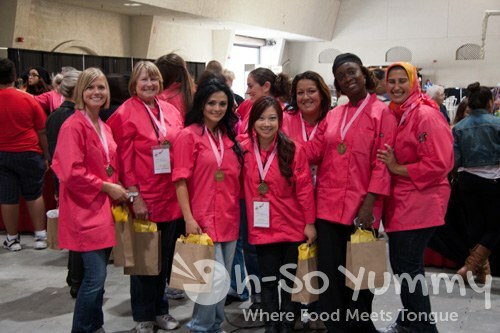 There were a few other talented chefs on the various stages at various times, but we didn't have time to see them all. We got the munchies and looked around for something to catch our eye. We first found Haks BBQ, which was right outside the entrance to the event. Chef Sharone Hakman sold a feisty bbq sauce to complement the all natural beef slider and kobe beef sausage! The slider was cooked about medium but Dennis and I prefer at least medium well for this kind of meat. Our favorite dish from them was the sausage though, which had a nice crisp on the outside and bursting with juicy flavor on the inside! I want to find their vendor for that meat! 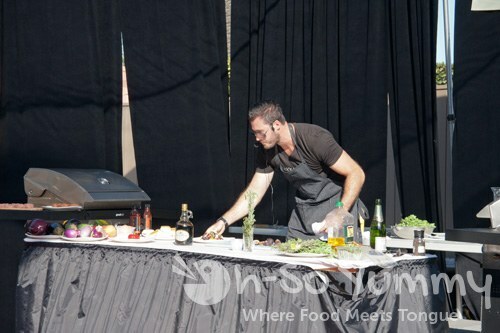 Chef Sharone Hakman also had a live demo on the Outdoor Grilling Stage. One of his dishes was a fig salad, another was a gazpacho, and beef sliders WITH buns. Unfortunately we didn't get to taste these. We were still hungry and bought a combo plate from Tri Tip & More. The meat was well cooked but could have used a stronger seasoning, maybe more salt, and the bbq sauce just couldn't compete with Hak's. We also visited some vendor booths and found some tasty snacks as well as refreshing drinks! We definitely enjoyed our first visit to the Gourmet Experience and would be willing to check it out again next year in April! Disclaimer: we were provided tickets for this event but the opinions are strictly our own.